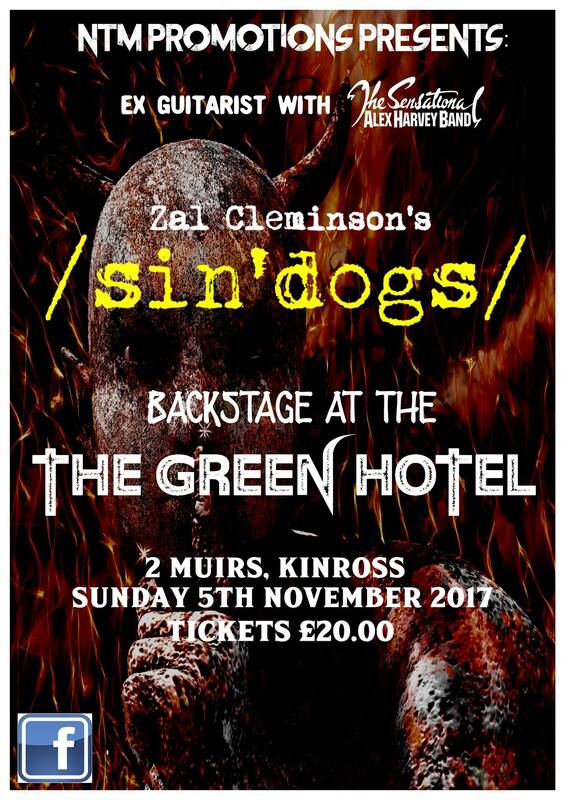 The legendary Zal Cleminson is back with his new band /sin’dogs/. The band has scheduled a UK tour for November/December 2017, but Backstage at the Green offers you the chance to see their debut gig, and you can say ‘I was there’ – If you get tickets for the show on 5th November 2017 (they will go fast!). Zal is widely-respected for his work with the Sensational Alex Harvey Band providing incendiary guitar and writing on seminal albums such as ‘Framed’, ‘Next’, ‘Tomorrow Belongs to Me’, ‘The Impossible Dream’ and others. Zal also played guitar in Nazareth in the 80s and worked as a session musician, touring with Elkie Brooks, Bonnie Tyler and Midge Ure. Many respected guitarists have cited Zal as an influence on their playing. /sin’dogs/ sees Zal return to his roots with powerful new material incorporating both progressive and heavy rock elements. The band will be recording in September 2017 and hope to release some of the new material before the end of the calendar year. 2018 will see the release of a debut album, and plans to tour extensively throughout the year will coincide with festival appearances.